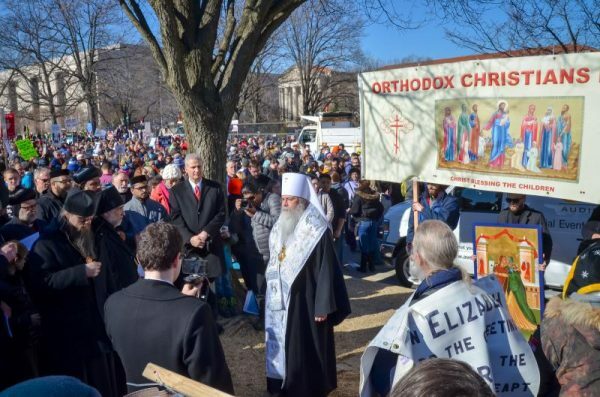 Metropolitan Tikhon offers prayers at outset of 2018 DC March for Life. January 22, 2019 marks the 46th anniversary of the Roe v. Wade decision that legalized abortion in the United States, and Orthodox Christians from across the US will be marking the occasion by participating in the annual March for Life in the US Capital on Friday, January 18. His Beatitude, Metropolitan Tikhon will join other Orthodox Christian hierarchs, seminarians, and clergy and faithful from around the country in the annual March, which will conclude with the celebration of Memorial Prayers for the victims of abortion near the US Capital. The theme of this year’s March is “Unique From Day One”. Orthodox Christian faithful from across the US at 2018 DC March for Life. The March will begin at noon on the grounds of the Washington Monument. 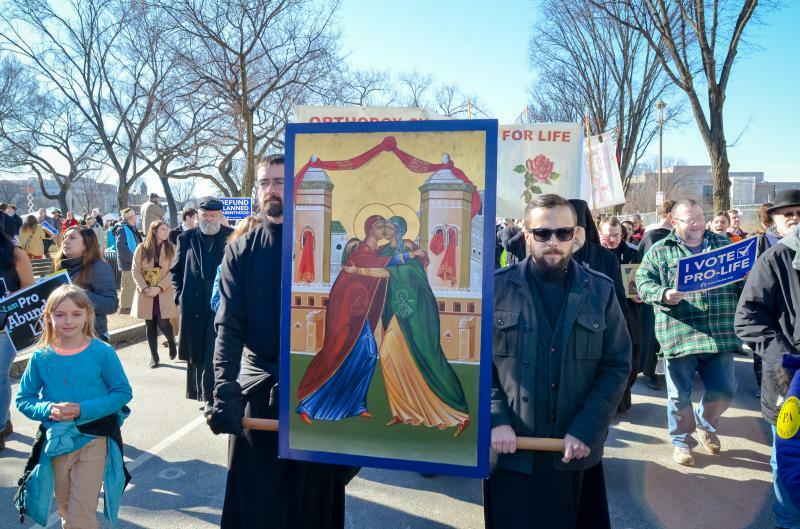 Orthodox Christian participants are asked to gather at that time at the “Orthodox Christians for Life” banner, which will be prominently displayed at the southwest corner of 12th Street and Constitution Avenue. Metropolitan Tikhon, together with Eminence, Archbishop Melchisedek; His Eminence, Archbishop Michael; His Grace, Bishop Daniel; and representatives of the OCA Chancery staff will join other Orthodox Christian marchers for the opening rally and presentations prior to the March. Representing the Assembly of Canonical Orthodox Bishops of the United States of America will be His Eminence, Metropolitan Methodios of the Greek Orthodox Metropolis of Boston. Archbishop Benjamin and Orthodox marchers at 2018 San Francisco Walk for Life West Coast. Metropolitan Tikhon and an entourage from the OCA also will attend the annual Rose Banquet at the Renaissance Washington DC Downtown Hotel on the evening of the March. On the eve of the March—Thursday, January 17—Metropolitan Tikhon and the OCA delegation will attend the Prayer Vigil for Life at the Basilica of the National Shrine of the Immaculate Conception. Slated to begin at 5:30 p.m., the Vigil will include a homily by the Most Reverend Joseph F. Naumann, Roman Catholic Archbishop of Kansas City, KS and Chair of the US Conference of Bishops’ Committee on Pro-Life Activities. General information on the DC March and Rose Banquet — including details on making reservations — is available on the March for Life website. In related news, His Grace, Bishop Paul will lead Orthodox Christian marchers at Chicago’s March for Life on Sunday, January 13. 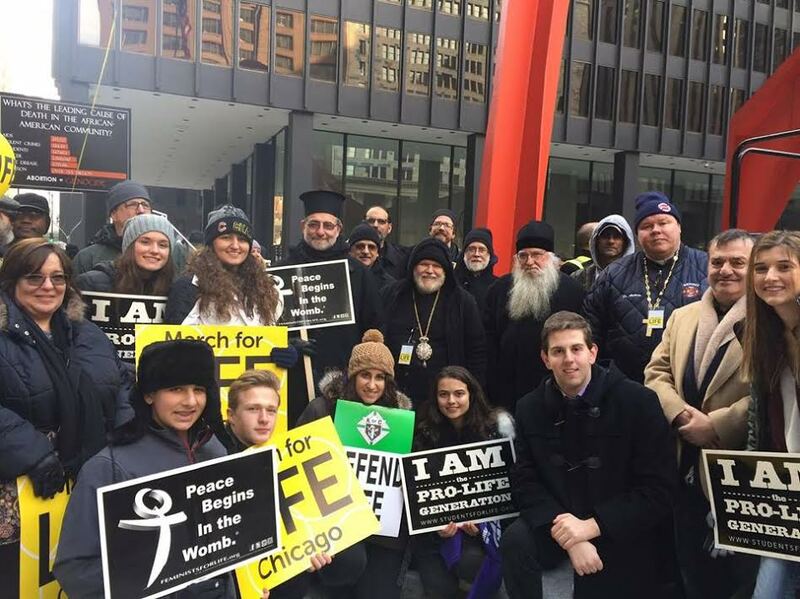 Marchers will gather at Federal Plaza at 2:00 p.m. for the opening program and march, which will conclude at 4:00 p.m.
Bishop Paul with Orthodox Christian marchers at Chicago’s 2017 March for Life. The 15th Annual Walk for Life West Coast will be held in San Francisco on Sunday, January 26. A Pan-Orthodox Sanctity of Life service will be celebrated at the Civic Center at 11:30 p.m., while the rally and March will begin at 12:30 p.m. at Civic Center Plaza. Additional information is available online. Visit the Orthodox Christians for Life website for further information and updates.